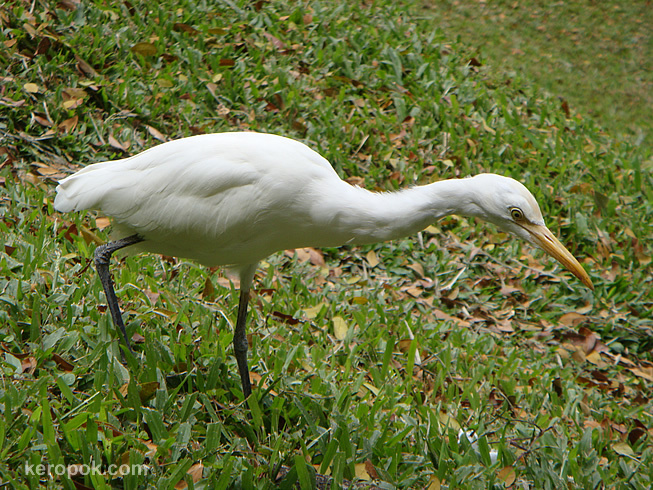 'Boring' Singapore City Photo: Closer look at Egret at NUS. If you are wondering where this photo was taken? This bird lives in the grass patches at the National University of Singapore. You get to see many of them around. It looks like it can't fly eh? But they do fly and fly very gracefully too. If you want to hear many types of birds chirping, many species of birds can be spotted along the big trees along the buildings between Yusof Ishak House and University Hall. Their sharp eye and ears can spot and hear the different chirps of the birds. It's a fantastic picture! I like the bird very much! think it's getting increasingly familiar with the students and staff of NUS, haha... Oh is it called an egret? I've been searching for the name of it for some time. there are some in hougang at this river which was cementized and kind of termed a longkang now. very pretty birds. funny looking bird, looks like she(he)'s looking for something in grass. have a lovely sunday Keropok! He's posing beautifully for your great photo. Love it. Great clarify - that eye is amazing. I like this bird who is looking for a small snake to eat. I bet he finds one too. chanced upon your blog. love yr pictures. it's a cattle egret. a friend who worked in birdpark told me years ago.